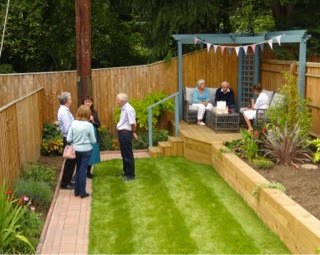 This afternoon my young friend hosted her first garden party to introduce her new garden. About twenty friends, neighbours and colleagues came. 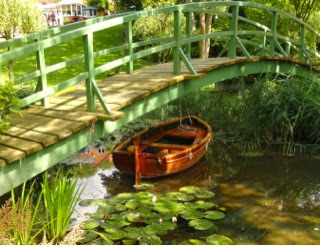 We'd spent the morning sweeping, raking, weeding, fixing shelves in the shed, putting up bunting, and then preparing the drinks and nibbles. Here are a few of the guests at the end of the garden. Lots more planting to do, but it's going well so far with a little 'jungle area' started next to the pergola. And keeping guard nearby is a lone soldier from the Chinese army of terracotta warriors. 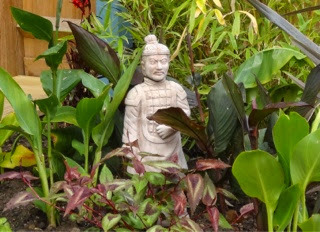 To keep him company he has a comrade guarding the corner by the pergola. After the torrents of rain during the week we were blessed with a nice dry and mainly sunny afternoon. 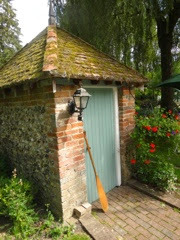 To the artfully positioned oar casually leaning against the genuine Edwardian changing room. 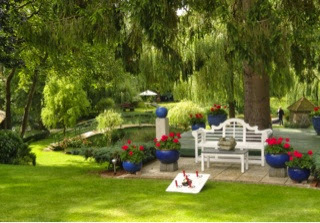 As you can see there was a variety of garden games laid out - from uphill quoits, bowling and hoopla. 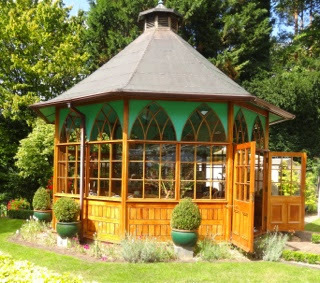 Together with half a dozen old friends we savoured a sumptuous lunch in this very smart pagoda. 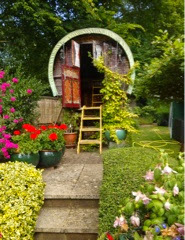 To this lovely old caravan. Looked for a little Hobbit there but couldn't find one. No doubt having a snooze somewhere in the sunshine. So what else have I been doing? Many hours painting my large portrait of the boatman - about ten a day. But I reluctantly put down my big brushes (size one and zero) to pick up my treble zero's to earn a living by painting three miniature portrait commissions. The second is nearly finished but I can't show either on my blog till the clients give permission. It's also time to get a dozen or so entries ready for the upcoming Royal Society of Miniature Painters October exhibition. And for the big Florida exhibition a couple of months later. Last Sunday we picked up Val and drove over to Bampton to have lunch with old friend Joanne. My young friend and I had a little walk around the town in the afternoon hoping to see a bit of Downtown Abbey filming - they often use the old church and surrounding roads as locations. 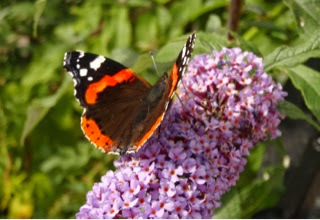 But they were having a rest day so I photographed this pretty Red Admiral butterfly on a buddleia bush. 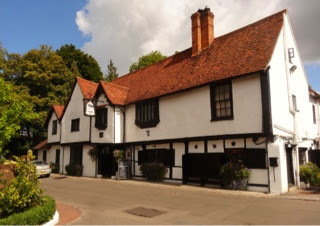 We've just returned from a delightful lunch at the Olde Bell at Hurley with old friends from my Singapore days. Singapore is my second home as I've spent three completely different lives there. First, from 1956 to 1957 when I was doing my National Service drawing maps for the Malayan Emergency. Second, from 1960 to 1964 when I joined Papineau Adverting as their Art Director. And third, from 1970 to 1978 when I became Regional and Far East Director for the American Grant International Advertising Agency. Now this leads on to today's lunch. 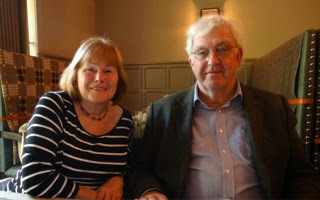 A couple of weeks ago we were invited for lunch at the Olde Bell by Gerry and Marie Browne. We were friends in my sixties era. Coincidentally I also have friends from my seventies era - another Gerry who is married to Marietta. Their surname is Brownlie. I think both Gerry's read my blog. When we arrived at the restaurant today I had explained to my young friend that Gerry was about her height and came from Yorkshire. So when we met I must admit I was surprised to see that Gerry was now over 6 ft tall. And had changed his accent! By this time, as Gerry Browne reads this, he'll probably be laughing his head off because having not seen him and Marie for 50 years I had mistaken him for my other friend, Gerry Brownlie! It was only a little later when they showed me some old photographs that it dawned on me that I was a complete idiot and had mixed the two Gerry's up! I didn't confess my senior moment at the time so he and Marie will be chortling mightily now I expect. 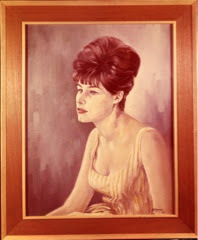 In 1964 we met up frequently, and I even painted an oil portrait of Marie at the time. Being in advertising at the time I was very much an amateur, but here it is anyway. 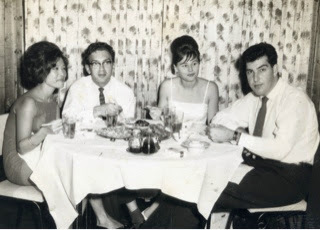 And here is a photograph of Marie and Gerry in 1964 together with myself and a friend called Susan. I'm second from the left, by the way. And to bring you right up-to-date, here are Marie and Gerry today. Sorry, Gerry and Marie. But thank you for such a nice lunch. It was great to meet up again after so many years. 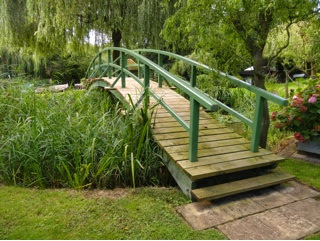 So to try and replenish a few of my obviously lost brain cells, when we got home this afternoon my young friend and I took the boat down the river to Hambleden and back. She drove while I snoozed a bit in the hot sunshine.